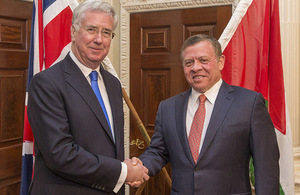 Defence Secretary Sir Michael Fallon has praised the crucial role Jordan plays in the fight against Daesh, following a meeting today with His Majesty King Abdullah II. During a visit to London, where the King also met with the Foreign Secretary, Sir Michael discussed the UK’s deep and longstanding support to Jordan, an important regional ally. As a country on the front line in the fight against Daesh, Jordan is working closely with Britain and other Coalition members to defeat the terror group. Jordan was one of the earliest contributors to airstrikes against Daesh, operating four F-16 fighters, as well as other transporter aircraft. Jordan is a longstanding and key ally of the UK and an important partner in countering the shared threats we face. We stand shoulder to shoulder in the fight against Daesh, our militaries exercise together and we’re assisting Jordan in the development to develop of its armed forces. Through our global role we’re committed to helping Jordan in sustaining its stability which in turn makes Britain safer and more secure. Building up Jordan’s border security, through helping develop their border surveillance capability. 200 UK forces last year participated in Exercise Shamal Storm 16, and this year British forces will work alongside a stepped up Jordanian force. The UK leads and helps to fund Jordan’s Quick Reaction Force (QRF). The QRF is a Rapid Response force which has the ability to respond to threats at distance. Through NATO, Britain is providing financial support to developing Jordan’s cyber defence, military exercises and information protection.